سواءً كنت مسافراً بغرض السياحة أو العمل, Aussie Resort هو خيار عظيم للإقامة خلال زيارتك جولد كوست. إن موقع الفندق الاستراتيجي، الذي يبعد 1. Km فقط عن مركز المدينة، يسمح للنزلاء بالوصول سريعاً وبسهولة إلى العديد من الوجهات المحلية المثيرة. يشكل هذا الفندق ملاذاَ مريحاً للاسترخاء ويمنح زواره فرصة للاستجمام والتجدد، وهو يقع على بعد خطوات من المعالم السياحية الكثيرة للمدينة كمثل: بورليغ هيدز, Burleigh Head National Park, Gold Coast Antique Centre. استمتع بالخدمات الراقية والضيافة التي لا مثيل لها بهذا الفندق في جولد كوست. يقدم الفندق تسجيل دخول/خروج سريع, تخزين الأمتعة, ركن للسيارات, التوصيل من وإلى المطار, مركز رجال الأعمال لضمان الراحة القصوى لضيوفه. تتضمن كل غرف النزلاء وسائل الراحة والتسلية المصممة خصيصاً لضمان الراحة القصوى للضيوف. يقدم الفندق مجموعة واسعة من وسائل الراحة المتنوعة، كمثل: حوض الاستحمام, مسار جولف - ضمن 3 كم, حمام سباحة خارجي, سبا, حديقة. اكتشف مزيجاً ساحراً من الخدمة الاحترافية والخيارات الواسعة من وسائل الراحة والمتعة في Aussie Resort. Great location in Burleigh, however is on the highway side, not the ocean side...which from looking at the map it appeared to me like it was on the ocean side. Parents were very happy with it, they were driving up from Victoria and appreciated the washing machine, dryer and kitchenette. We stayed for 2 weeks, great service, great location would stay again. We stayed in a 1 bedroom apartment, very happy with everything, clean and well presented,well equipped kitchen, air conditioning, Foxtel and Wifi, friendly helpful managers, would highly recommend to anyone. Would highly recommend Aussie Hotel! Very helpful staff who made it a pleasant stay. Helpful and nice manager. Great location - walking distance to the beach. Clean and well equipped apartment. Chris and Kelly are wonderful hosts and always make you feel welcome. Thanks guys! Rooms are large but slightly dated. Great pool and amazing, friendly staff made a great trip. Great location , my son loved the pool and spa. Will definitely stay again. We are two grandmothers who came to Qld for five days of self-indulgence and Aussie Resort did not disappoint! Our units were large, clean and attractive with plenty of mod cons. The manager was most helpful and friendly. We were a short walking distance to the beautiful Burleigh beach and James Street's cafes and shops. The accommodation was set in beautiful tropical grounds and perfect for sitting on our private balcony and gazing at the surrounds. Very reasonably priced and we would definitely stay there again. Thank you! Sue and Jean from SA. 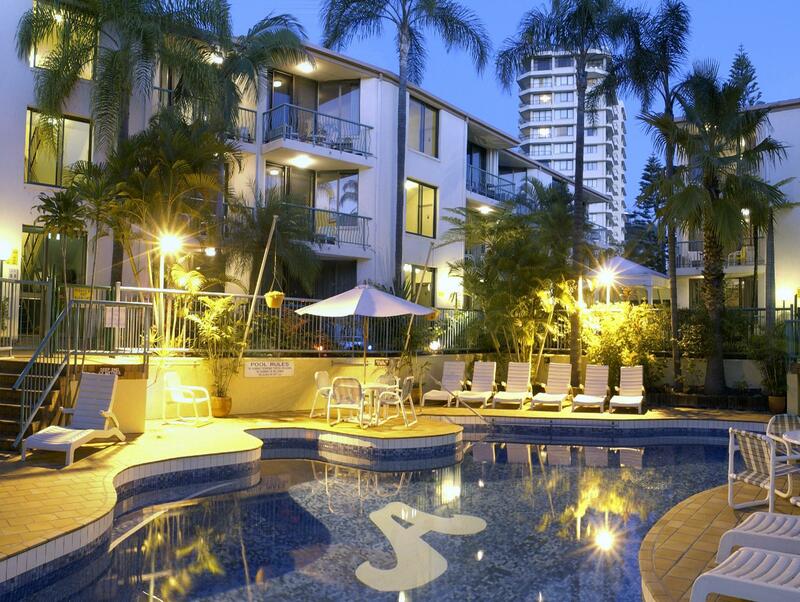 These self contained apartments are only 50m walk to beautiful Burleigh beach with lifeguards and amenities and within easy walking distance of Burleigh Heads centre with great cafes, restaurants and shops. The apartment we stayed in didn't have a sea view or view over the swimming pool. Staff were very friendly and helpful. Especially at start when met us and help[ed with bags. 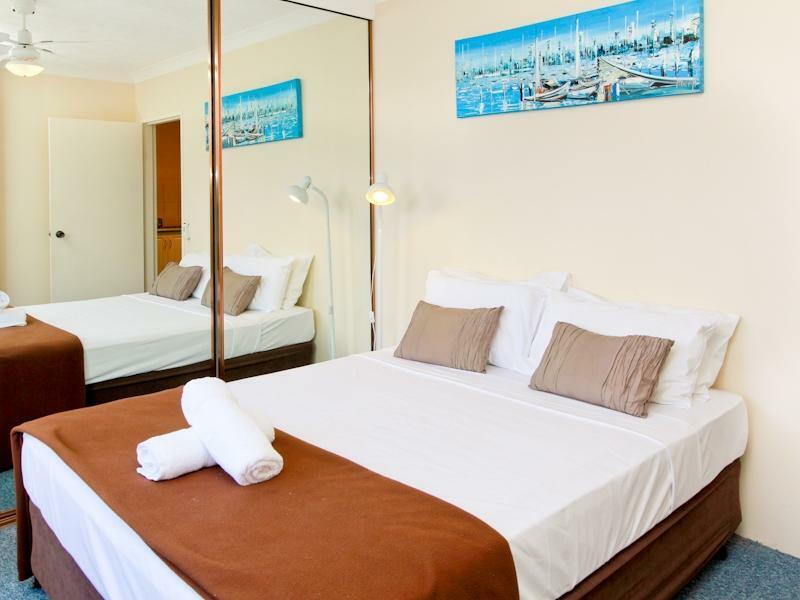 Rooms are spacious, clean, tidy with separate living area, washing machine and dryer in room. Couple of downsides, you need to use stairs to get to upper levels so can be quiet difficult. Also the place is in need of an update. Although the room was clean and tidy the facilities and room amenitioe were dated and in some cases falling apart (toaster kept tripping the power!). Not a fancy place, but had everything I needed, and close to the actual beach. A bit dated, but kept in good condition. Owners were helpful and pleasant. Overall we had a good 3 days stay at this prime location. Excellent underground parking conditions, and plenty restaurants in walking distance. A couple not so nice things for us: The poor wifi was annoying, and we had to get us AUS sim cards to access he internet for further trip planning. Not that many el outlets available, and none near the bed. The day before leaving we used the washing machine (complimentary detergent) and dried the clothes at the balcony. Just before leaving we wanted to take out the last moisture but the dryer machine did not to work. Very Friendly staff, free wifi and large clean unit. Just Metres from the beach. Great value! so much cockroach. we were very surprise. we could not sleep because of cockroach.